Basic ingredients: Set in a converted Victorian School in Battersea, the Academy was established by internationally renowned chef Anton Mosimann in 1996 and is run now by his son Mark. The Academy offers a homely environment in which to receive top tuition on a variety of courses from pasta making and seafood to mushroom foraging and Asian street food on half-day, one-day and tailor-made courses, including competitive team-building courses. They say: Our experience and contacts within the industry, as well as our unique facilities at our Battersea home, mean that no matter what your imagination cooks up, we can deliver. We say: The Academy houses an impressive library of more than 6,000 cookery books dating from the 15th century. 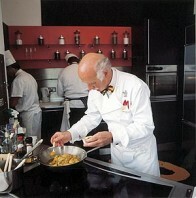 Some of the courses such as the Introduction to Molecular Gastronomy include lunch at the Club, Anton Mosimann’s private members’ restaurant in a former church in Belgravia. If you’re really lucky Anton himself may drop in.